The last surviving head of the coconut definitive, and the only woman to appear on it, was Elizabeth II (1926–). 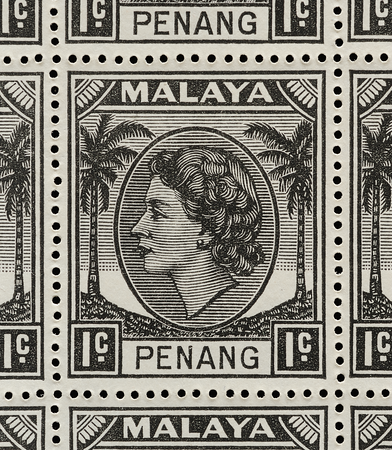 This depiction of the queen at only 26 years of age, denoted as type A in the Crown Agents archive, appeared on the coconut definitives of Penang and Malacca. It was derived from a photograph taken that year by Dorothy Wilding. The queen had personally picked the photograph, and the engraving was done by De La Rue veteran Leonard Vincent Phillips (De La Rue 1952). 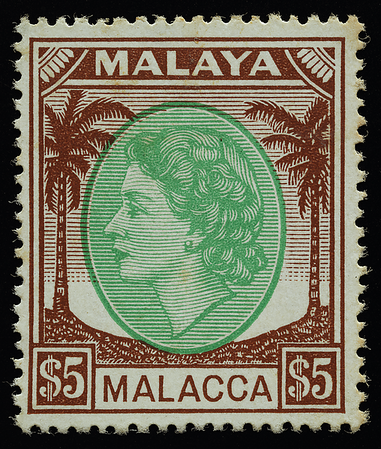 This is one of the very few portraits of her ever to be rendered as line art, since the majority of Commonwealth stamps were now photogravured. 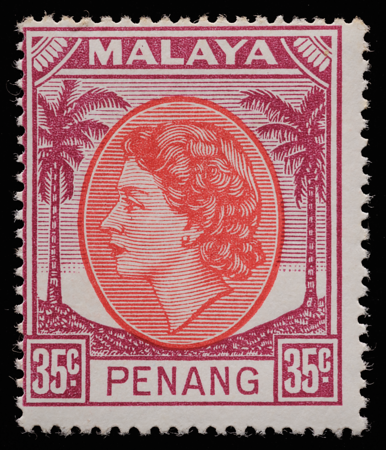 Regrettably Singapore did not get QEII on its coconut definitives, since a separate pictorial design was already being prepared (Stanway 2009). Completely new dies were used for the duty plate as well as the key plate. The print has taken on a more sterile machined look, leading one to think that the engraving was now being done with the aid of more sophisticated precision tools. The ground on which the palms stand has changed to an almost carpet-like texture lacking differentiation from the trunks of the palms. The soil piles up against the oval noticeably higher on the left than on the right, creating a somewhat uncomfortable asymmetry. The background lines behind the palms are no longer compressed towards the top or faded away smoothly towards the bottom, sacrificing some of the realism of the sunset sky. The density gradation of the background within the medallion to enhance the shadows is hardly noticeable now. The visual sterility of the new plates heralded the digital age, when analogue nuances were sacrificed in the pursuit of binary precision. The famous plate flaw that makes the queen look as if she's smoking a cigarette. The coconut definitive’s long-running Hongkong counterpart, which also uses the line-art profile, captures the vibrant essence of the Fragrant Harbour in an ornate bilingual imprint underpinned by the imposing structural order of the rectangular scaffold. The design, proposed by Hongkong's governor back in 1861 (Gurevitch 1993), survived for a century. 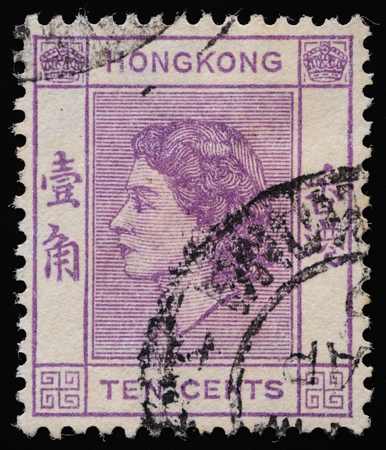 It was a radical departure from De La Rue's usual style (Finlay 1974), and had its origins in the very first stamps of imperial China. 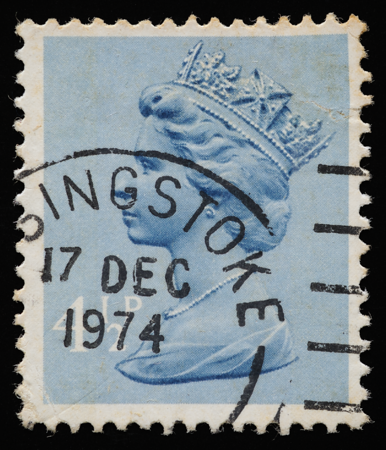 The line-art profile used in these colonies predated the use of profile portraits of the queen on the stamps of Britain herself by more than a decade; it was only in 1965 that essays incorporating the profile portrait were produced for British stamps, after the preceding oblique photographic portraits had drawn numerous complaints from stamp designers and postal authorities (Muir 2007). Indeed, the early line-art profile may be the evolutionary origin of another timeless design, the Machin definitive (below).